The 10 Best Senior Discount Offers in Georgia! Getting older has its share of downsides, but if you happen to be aging in Georgia you’ll be glad to know there’s a sweet upside to living longer: senior discounts. You might be surprised to learn that some places use the term ‘senior’ loosely, offering deals to individuals as young as 55. These 10 best senior discount offers in Georgia almost make you look forward to getting older. There’s nothing better than getting a deal on something you already use. Georgia Power Company customers ages 65 and over with a household income of 23,540 per year or lower are eligible to receive an $18 credit on their monthly energy bill. To sweeten the pot, you can also get up to $6 per month in fuel credit. You need to apply for the program, but the few minutes it takes could mean big savings year-round. In addition, there are also telephone and natural gas credits available to citizens, which can be found on the Georgia Public Service Commission website. Seniors age 65 and up can apply for a Reduced Fare Breeze Card that lowers their fare costs on Atlanta’s Marta. This convenient transportation rail line is especially beneficial to seniors traveling in the city without the hassles of driving in heavy traffic. A favorite grocery shopping destination for many, Publix knows how to treat its seniors right. They offer a 5 percent discount on Wednesday purchases for individuals age 60 or older. It might not sound like much at first, but it quickly adds up to hundreds of dollars per year in savings. If you’re 55 or older, you’ll want to know about Ross’s senior discount. They’re already-low prices get even sweeter with a 10 percent discount on Tuesdays. They carry a huge variety of everything, so this discount will come in handy year-round. If you’re a senior with a shopping habit, you’ll want to head to your nearest Stein Mart stores on the first Monday of every month. Customers 55 and up will score a 20 percent discount on purchases (limited exclusions) provided you have a valid ID. Stein Mart already offers low, everyday prices, so this deal can help you stretch your dollars even further. Enjoy your retirement by traveling to the places you always meant to visit but never made time for. Amtrak offers a generous 15 percent discount on most of their trains. You need to be at least 62 to take advantage of this offer. Off for Thanksgiving in New Orleans and to see the Eagles play. Will be missing Mac as he flys down on Friday. AARP members grant you access to a free coupon book at Tanger Outlet Shopper Services. These coupon books are tailored to each outlet mall to help you maximize your savings. The value of these books are around $1.000, and most people have to pay for them. Consider it your lucky day. No matter where you’re traveling, there’s likely a Hampton Inn nearby. This hotel group offers up to a 10 percent discount for seniors if you book your reservation 72 hours prior to your stay. If you prefer to travel in style, you’ll love saving up to 50 percent off the normal daily rate at a Hyatt hotel. One caveat, though: not all locations will offer this discount. It’s in your best interest to call ahead to confirm their participation in the program if you’re expecting the best rate! Aging doesn’t mean sacrificing style, especially if you shop at Hamrick’s. 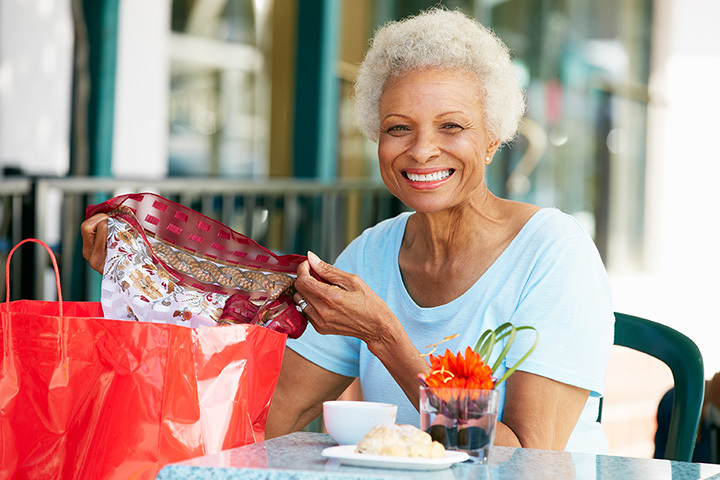 Seniors can score a senior discount on Tuesdays, giving you all the more reason to fuel your shopping habit.